The 1863-S Liberty double eagle claims a mintage of 966,570 pieces, struck at the height of the Civil War era. The 1863-S Liberty double eagle claims a mintage of 966,570 pieces, struck at the height of the Civil War era. Like most Type One double eagles, the 1863-S was easily located in lower grades but virtually unobtainable in Mint State before the shipwreck recoveries of the S.S. Republic and the S.S. Brother Jonathan yielded nearly 300 relatively high-grade pieces. However, most examples seen are in AU grades, and the 1863-S remains rare in MS62 condition. Only 21 have been graded higher by NGC. 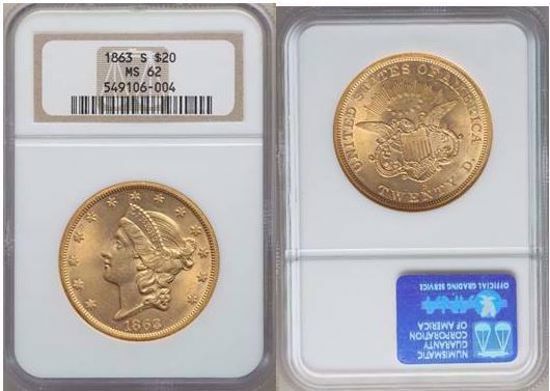 Listed at $21,800 in the Coin Dealer Newsletter (Wholesale Price Guide), $26,000 on the NGC Price Guide and $23,500 in CoinWorld Trends.